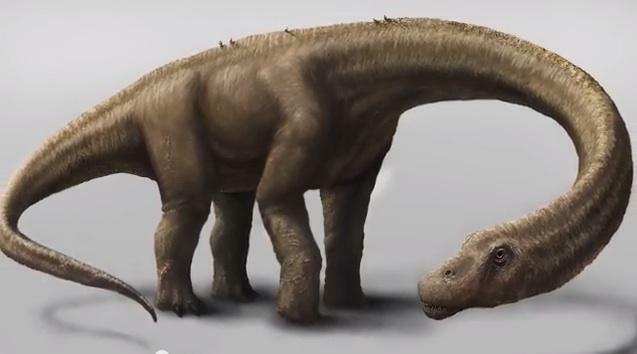 In life, Dreadnoughtus would have been about 86 feet (26 meters) long and weigh nearly 60 tons, heavier than a [Chieftain] tank, Drexel University paleontologist Ken Lacovara and colleagues calculate. That’s so big, the scientists write, that adults of the species would have been “nearly impervious to attack” by predators that stalked the same floodplains between 84 million and 66 million years ago. Among the largest of dinosaurs, titanosaurs like Dreadnoughtus were hefty herbivores with tiny heads, long necks, and tapering tails. The dinosaur’s fossilized bones were found in Argentina’s Patagonia region by a team from Drexel University. Here’s a video about the animal and its discovery.